Handcare gift set with toffee scent. The box contains: 1 x Hand Wash, 1 x Hand Cream, 1 x Cuticle Cream, 1 x Pair of Gloves and 1 x Beautilicious Badge. This product smells absolutly gorgeous,really sweet and yummy. "This product smells absolutly gorgeous,really sweet and yummy. 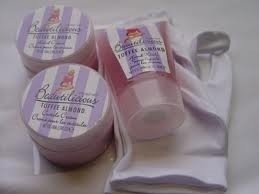 The hand cream absorbs really well leaving your hands nice and soft and smelling great The cuticle..."